"A million New Yorkers are good without God. Are you?" These words are part of a coordinated multi-organizational advertising campaign designed to raise awareness about people who don't believe in a god. The prominent ads will go up Monday, October 26, in a dozen Manhattan subway stations. 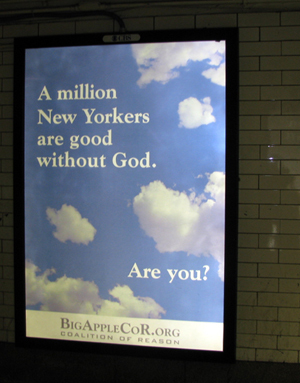 Placed by Big Apple CoR, the New York City Coalition of Reason, with funding from the United Coalition of Reason, the ads feature an image of blue sky and clouds with the words superimposed over. "The point of this $25,000 subway ad campaign is to reach out to the million or more humanists, atheists and agnostics living in the New York metropolitan area," explained Fred Edwords, head of the United Coalition of Reason. "Nontheists sometimes don't realize there's a community for them because they're inundated with religious messages at every turn. So we hope this will serve as a beacon and let them know they aren't alone." Reaching out to nontheists isn't the only goal of the subway campaign. "We want everyone to know that people can be good without religious beliefs," said John Rafferty, a spokesperson for Big Apple CoR. "There is a lot of misinformation out there about us. But we humanists, agnostics and atheists are part of society. We're your friends, neighbors coworkers and family members." The subway campaign is part of a nationwide effort. Billboards and transit system ads funded by the United Coalition of Reason have gone up around the country this year, including those in places as far flung as Charleston, South Carolina; Dallas and Fort Worth, Texas; Des Moines, Iowa; Morgantown, West Virginia; Phoenix, Arizona, and New Orleans, Louisiana. A billboard will appear later today in Chicago, Illinois, and next week in New Brunswick, New Jersey. In a month, more are slated for California and elsewhere. For more details on the subway ad campaign that signals the launch of Big Apple CoR, and for an image of the ad, go to www.bigapplecor.org . News will be forthcoming on further developments as they materialize. Click HERE for a high resolution version of the ad. Big Apple CoR (www.bigapplecor.org ) is a group of like-minded member organizations from throughout the New York metro area that share a worldview grounded in reason over superstition and scientific truth over revealed truth. The United Coalition of Reason (unitedcor.org ) exists to raise the visibility and sense of unity among local groups in the community of reason by providing funding and expertise to help them cooperate toward the goal of raising their public profiles.